For other storms of the same name, see Tropical Storm Matthew. Hurricane Matthew was the first Category 5 Atlantic hurricane since Felix in 2007. Matthew caused catastrophic damage and a humanitarian crisis in Haiti, as well as widespread devastation in the southeastern United States. The deadliest Atlantic hurricane since Hurricane Stan in 2005, Matthew was the thirteenth named storm, fifth hurricane and second major hurricane of the 2016 Atlantic hurricane season. It caused extensive damage to landmasses in the Greater Antilles, and severe damage in several islands of the Bahamas who were still recovering from Joaquin which had pounded such areas nearly a year earlier. At one point, the hurricane even threatened to be the first storm of Category 3 or higher intensity to strike the United States since Wilma in 2005, but Matthew stayed just offshore paralleling the Floridan coastline. Originating from a tropical wave that emerged off Africa on September 22, Matthew developed into a tropical storm just east of the Lesser Antilles on September 28. It became a hurricane north of Venezuela and Colombia on September 29, before undergoing explosive intensification, ultimately reaching Category 5 intensity on October 1 at just 13.4°N latitude – the lowest latitude ever recorded for a storm of this intensity in the Atlantic basin, breaking the record set by Hurricane Ivan in 2004. Matthew weakened slightly and fluctuated in intensity while making a northward turn toward the Greater Antilles, remaining a strong Category 4 hurricane as it made its first landfall over Haiti's Tiburon Peninsula early on October 4, and then a second one in Cuba later that day. Matthew weakened somewhat but re-intensified as it tracked northwest, making landfall in the northern Bahamas. The storm then paralleled the coast of the southeastern United States over the next 36 hours, gradually weakening while remaining just offshore before making its fourth and final landfall over the Cape Romain National Wildlife Refuge near McClellanville, South Carolina as a Category 1 hurricane on the morning of October 8. Matthew re-emerged into the Atlantic shortly afterward, eventually completing its transition into an extratropical cyclone as it turned away from Cape Hatteras, North Carolina on October 9. The remnants of Matthew continued to accelerate towards Canada where it was absorbed by a cold front. Widespread effects were felt from Matthew across its destructive path, however, the most significant impacts were felt in Haiti, with US$1.9 billion in damage and 546 deaths, making Matthew the worst disaster to affect the nation since the 2010 earthquake. The combination of flooding and high winds disrupted telecommunications and destroyed extensive swaths of land; around 80% of Jérémie sustained significant damage. Four people were killed in Cuba due to a bridge collapse, and total losses in the country amounted to US$2.58 billion, most of which occurred in the Guantánamo Province. Passing through the Bahamas as a major hurricane, Matthew spread damage across several islands. Grand Bahama was hit directly, where most homes sustained damage in the townships of Eight Mile Rock and Holmes Rock. Preparations began in earnest across the southeastern United States as Matthew approached, with several states declaring states of emergencies for either entire states or coastal counties; widespread evacuations were ordered for extensive areas of the coast because of predicted high wind speeds and flooding, especially in the Jacksonville Metropolitan Area. In Florida, over 1 million lost power as the storm passed to the east, with 478,000 losing power in Georgia and South Carolina. While damage was primarily confined to the coast in Florida and Georgia, torrential rains spread inland in the Carolinas and Virginia, causing widespread flooding. A vigorous tropical wave moved off the coast of Africa on September 22 and moved rapidly across the Atlantic, being monitored by the National Hurricane Center (NHC) for possible tropical cyclogenesis. Despite possessing tropical-storm winds as it approached the Lesser Antilles on September 27, the wave could not initially be classified as a tropical cyclone, as reconnaissance aircraft could not find a closed center. However, by 12:00 UTC on September 28, the wave developed a closed circulation while located near Barbados, hence becoming a tropical storm, and was assigned the name Matthew. Continuing westward under the influence of a mid-level ridge, the storm steadily intensified to attain hurricane intensity by 18:00 UTC on September 29. The effects of southwesterly wind shear unexpectedly abated late that day, and Matthew began a period of explosive intensification; during a 24-hour period beginning at 00:00 UTC on September 30, the cyclone's maximum winds more than doubled, from 80 mph (130 km/h) to 165 mph (270 km/h), making Matthew a Category 5 hurricane, the first since Felix in 2007; the rate of intensification has only been exceeded a few times in the Atlantic since records began. Due to upwelling of cooler waters, Matthew weakened to a Category 4 hurricane later on October 1, before attaining a secondary peak intensity with winds of 155 mph (250 km/h) late on October 2. Slowly rounding the ridge, Matthew fluctuated in intensity within the Category 4 range from October 1–5. Intensification resumed again late on October 3 and culminated when Matthew made landfall near Les Anglais, Haiti, around 11:00 UTC on October 4 with winds of 150 mph (240 km/h) and a pressure of 934 millibars (27.6 inHg), making it the strongest to hit Haiti since Cleo in 1964. Continuing northward, the hurricane struck Maisí in Cuba early on October 5 as a slightly weaker storm. Cuba's and Haiti's mountainous terrain weakened Matthew to Category 3 status, as it began to accelerate northwestwards through the Bahamas. Restrengthening occurred as Matthew's circulation became better organized, with the storm becoming a Category 4 hurricane again while passing Freeport. However, Matthew began to weaken again as an eyewall replacement cycle took place. The storm significantly weakened while closely paralleling the coasts of Florida and Georgia, the western portion of the outer eyewall came ashore in Florida as a Category 3 hurricane, while the inner eyewall remained just offshore. Matthew weakened to a Category 2 hurricane late on October 7 and then to a Category 1 hurricane by 12:00 UTC on October 8. Hurricane Matthew as observed by NASA aboard the International Space Station on October 3. Around 15:00 UTC on October 8, the hurricane made landfall at Cape Romain National Wildlife Refuge, near McClellanville, South Carolina, with winds of 85 mph (140 km/h) and a central pressure of 963 mbar (28.4 inHg), which made it the strongest to strike the United States in terms of pressure since Irene in 2011, and the first hurricane to make landfall north of Florida in October since Hurricane Hazel in 1954. [nb 1] Convection became displaced from the center as Matthew pulled away from land due to increasing wind shear, with the NHC declaring the system an extratropical cyclone about 200 mi (320 km) east of Cape Hatteras, North Carolina, on October 9. The remnants persisted for another day, before they were absorbed by a cold front. Matthew set several records during its long and destructive journey. Matthew intensified into a Category 5 hurricane at a latitude of 13.4 degrees north, breaking the record set by Ivan in 2004, which had reached that intensity at a latitude of 13.7 degrees north. Matthew also maintained at least Category 4 status for the longest duration on record for the month of October, according to Phil Klotzbach of Colorado State University, doing so for roughly 5 days. On September 27, prior to Matthew becoming a tropical cyclone, LIAT began cancelling flights across the Windward Islands in anticipation of squally weather. Schools and businesses were closed for the duration of Matthew's passage on September 27 and 28 on Grenada, St. Vincent and St. Lucia; schools in Dominica suspended classes until October 3. Hewanorra International Airport and George F. L. Charles Airport on St. Lucia were closed on September 28. Six shelters were opened across the island; 133 sought refuge in them. Upon the formation of Matthew as a tropical cyclone on September 28, governments across the Windward Islands issued tropical storm warnings in anticipation of gale-force winds. 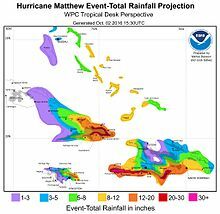 A map of forecast rainfall totals from Hurricane Matthew for the Greater Antilles and the Bahamas. Peak accumulations in excess of 30 in (760 mm) were expected along the southern coast of Haiti's Tiburon Peninsula. The storm's unusual south track prompted the issuance of tropical storm watches on September 28 for Aruba, Bonaire, Curaçao, and the northern coast of Colombia from the Colombia–Venezuela border to Riohacha. North Atlantic hurricanes affecting South America are uncommon. The watch in Colombia was later upgraded to a warning on September 30 as Matthew continued on a west-southwest track near the country. Residents across the ABC Islands were advised to board their homes and stock up on supplies, leading to long lines at supermarkets and gas stations. Curaçao's government postponed the 2016 general election until October 5. Government offices in Aruba closed for September 30. A local sporting event, the Kingdom Tournament, was canceled in Aruba. Schools across the Guajira Peninsula of Colombia suspended activities for September 30. Officials opened shelters and closed beaches across the peninsula. With Matthew posing a significant threat to Jamaica, emergency officials ordered all fishermen on the nation's cays and banks to evacuate to the mainland on September 29. The following day, Prime Minister Andrew Holness held an emergency meeting regarding the hurricane and placed the government on high alert. A hurricane watch was issued for the country on September 30, and later upgraded to a warning on October 1. Officials in Trelawny Parish placed 60 shelters on stand-by on October 2. Supermarkets were overwhelmed with residents stocking up on supplies, and many reported empty shelves and low supplies of bread, kerosene, and candles. Many people boarded up their homes and protected their property with sand bags. One hundred female prisoners were relocated from a facility in St. Catherine Parish to another in Kingston. Toll fees along Highway 2000 were to be waived during the hours before Matthew's arrival. Service at both Norman Manley International Airport and Sangster International Airport was scheduled to be suspended during the evening of October 2 or by the morning of October 3. The Jamaica Urban Transit Company scheduled to suspend services beginning at 6:00 p.m. local time. The Jamaica Public Service informed residents that the power grid might be shut off during the storm if conditions became severe. Members of the Jamaica Defence Force were deployed nationwide in advance of the hurricane in order to more swiftly deal with its aftermath. Schools and government offices suspended operations starting on October 3. A total of 900 shelters opened across Jamaica and the Urban Transit Company provided buses to evacuate people from Kingston to the National Arena. Local Minister Desmond McKenzie warned that the infrastructure of Kingston would be unable to handle the magnitude of rainfall expected. Prime Minister Andrew Holness warned residents that Matthew could be more severe than Hurricane Gilbert which devastated the nation in 1988. The animation shows Hurricane Matthew from September 28 to October 2, and 3-dimensional radar data from GPM's DPR instrument. Though forecast to pass over Jamaica at the time, the large extent of tropical storm-force winds prompted the issuance of a tropical storm watch for Haiti's Tiburon Peninsula toward the border with the Dominican Republic. Following an eastward shift in Matthew's predicted track, a hurricane watch was issued for much of Haiti on October 1, encompassing areas from Môle-Saint-Nicolas south to the Dominican Republic border; this was upgraded to a warning just hours later. The warning eventually encompassed the entire country by the afternoon of October 2. Residents on outlying islands of Haiti were evacuated to the mainland. Life-threatening rainfall was forecast to affect much of the nation, with accumulations averaging 15 to 25 in (38 to 64 cm) along the southern coast with isolated peaks up to 40 in (100 cm). Although government officials held meetings on storm preparation, Radio France Internationale reported that Haiti does not have the logistical capability to handle a large-scale disaster. Only 576 shelters, with a collective capacity of 90,000 people, were listed for all of southern Haiti. According to the International Organization for Migration, 55,107 internally displaced persons remained in camps or hosting sites without adequate protection from the hurricane. Provisional President of Haiti Jocelerme Privert addressed the nation on October 2, urging those living along the coast and in poorly constructed homes to evacuate and comply with authorities. Despite pleas from officials, many residents refused to leave their homes. Schools were closed for October 3–4, though government offices remained open. Nationwide, a total of 1,300 shelters were readied with a total capacity of 390,000 people. More than 18,000 volunteers and members of the Red Cross, community intervention teams, municipal committees, and local emergency services were readied to assist residents. At least 500 people were evacuated from Jérémie. Although civil protection officials took to the streets to warn people, many residents were unaware that Matthew was even approaching the country a day before its expected landfall. Evacuations continued through the hurricane's landfall with the total number of people in shelters reaching 9,280 by 2:00 a.m. local time on October 4. On October 5, the Electoral Provisional Council postponed the presidential election, the second round of the legislative elections and the first round of the Senate elections until November 20. On the morning of October 2, a tropical storm warning was raised for the southern coast of the Dominican Republic from Barahona west to the Haitian border, and a tropical storm watch was issued for the northern coast from Puerto Plata west to the Haitian border. At least 8,500 people were evacuated in southwestern areas of the country by the morning of October 3. The Meteorological Service of Cuba raised hurricane watches for all of southeastern Cuba on October 1, encompassing the provinces of Camagüey, Las Tunas, Granma, Holguín, Santiago de Cuba, and Guantánamo. This was subsequently upgraded to a warning on October 2 for all provinces except Camagüey. Non-essential personnel in the United States' Guantanamo Bay Naval Base began evacuations that day. Evacuations of more than 1 million people across Cuba started that morning, including 252,000 in Santiago de Cuba, and 230,000 from Las Tunas with priority placed on those along the coast. Across Santiago de Cuba, which suffered extensive damage from Hurricane Sandy in 2012, 218 shelters were opened and officials placed extra attention on Socapa, Caracoles, and Cayo Granma. Emergency personnel, primarily doctors, were dispatched to high-risk areas and supplies were stockpiled. The Government of the Bahamas began issuing hurricane watches on October 2 for southeastern islands as well as the Turks and Caicos. Flights across southern islands were cancelled and schools suspended operations beginning the following day. National Hurricane Center Director Richard Knabb (pictured) regularly filmed briefings on the forecast and expected impacts of Hurricane Matthew in the United States. On October 3, the governors of Florida and North Carolina declared a state of emergency. The next day, South Carolina governor Nikki Haley ordered an evacuation for those residents living within one hundred miles (160 km) of the coast. Interstate 26 in South Carolina eastbound between the coast and Columbia was reversed on Wednesday to facilitate movement away from the Lowcountry and Charleston areas. Evacuations of Cape Lookout National Seashore in North Carolina began this day as well. By October 4, North Carolina Governor Pat McCrory had ordered that evacuation be mandatory. A state of emergency was also declared for 13 counties in eastern Georgia. On October 5, Port Canaveral was closed by the U.S. Coast Guard, the first closure since 2004. Eight cruise ships and four cargo ships were scheduled to visit the port between October 5–9. On Cape Canaveral, home to both civilian and military spaceflight facilities, no rockets or spacecraft were in vulnerable positions; at the time of Matthew's approach, the next launch was scheduled for November 4. The Kennedy Space Center began preparations of the facilities on October 5. Older buildings at the KSC were designed to withstand winds of 105–125 mph (169–201 km/h); buildings constructed after 1992, when Category 5 Hurricane Andrew struck the Miami area, are built to withstand 130 mph (210 km/h) winds. At Cape Canaveral Air Force Station, the U.S. Air Force's 45th Space Wing began disconnecting electric power to non-essential facilities on October 4. For the fourth time in its 45-year history, the Walt Disney World Resort closes. Its theme parks are Magic Kingdom, Epcot, Disney's Hollywood Studios and Disney's Animal Kingdom water parks are Blizzard Beach and Typhoon Lagoon, and Disney Springs were closed at 5:00 p.m. Eastern Time on October 6 and did not open on October 7. This was the first time since 2004 that the parks have closed, all instances due to hurricanes. Other Orlando-area theme parks, including Universal Orlando resort and SeaWorld Orlando, also closed. The Southeastern Conference football game between LSU and Florida, scheduled for October 8 in Gainesville, was cancelled, while the SEC football game between Georgia and South Carolina, scheduled for October 8 in Columbia, was moved to October 9. The hurricane washed out NASCAR racing at Charlotte Motor Speedway on October 7 and 8, with the Drive for the Cure 300 race in the Xfinity Series originally scheduled for October 7 and the Bank of America 500 race in the Sprint Cup Series originally scheduled for October 8 both postponed until October 9. On October 6, U.S. President Barack Obama declared a federal state of emergency for Florida, later extending to include Georgia and South Carolina. Florida's governor Rick Scott urged over 1.5 million people to evacuate, with Hurricane Matthew expected to make landfall by the evening of that day. Several news anchors also issued dire warnings urging Floridians to evacuate. That same day, Georgia governor Nathan Deal ordered a mandatory evacuation for all areas of the state east of Interstate 95, and the Georgia Department of Public Safety reversed the eastbound lanes on a portion of Interstate 16 effective until the following day. On October 6, the conservative news aggregator Drudge Report—run by Matt Drudge—headlined a five-word comment on Matthew: "Storm Fizzle? Matthew Looks Ragged!" which linked to a Miami Herald article. Drudge later used Twitter to claim that the National Hurricane Center was lying to the public about the intensity of the storm, stating that measurements from Nassau, Bahamas, did not match the 165 mph (270 km/h) gusts listed in public advisories. The tweets implied that the hurricane was not as dangerous as it seemed and that politicians were trying to "blame mankind," referring to a blog posting about Hillary Clinton. This came on the heels of radio talk show host Rush Limbaugh's claims of the conspiracy to "sell" climate change. The claims of conspiracy were posted as Matthew posed a dire threat to Florida's east coast and when residents across the state were being urged to evacuate immediately. Drudge's commentary was quickly met with sharp condemnation and criticism from meteorologists and public officials. Democratic Representative Keith Ellison called the comments "irresponsible" and urged people to "not listen to this man." Jason Samenow of The Washington Post described it as an "incredible and offensive accusation", and stated that it "may have introduced enough doubt to lead [residents] into a decision they will regret." On St. Vincent heavy rains caused landslides and flooding across the island. One person was killed in the town of Layou when a boulder broke loose and crushed him. In nearby Buccament Bay, a river overtopped its banks, prompting at least 25 people to evacuate to emergency shelters. The Hermitage River rose by at least 3.6 ft (1.1 m) in one hour, and as a precautionary measure, the Central Water and Sewage Authority shut off all water service. Flooding also took place in Vermont, South Rivers, sections of Kingstown, Campden Park, Arnos Vale, and Langley Park. Debris deposited by flooded rivers rendered many roads impassable. Strong winds in excess of 60 mph (97 km/h) downed many trees and power lines on St. Lucia, leaving roughly 70 percent of the island without power. Landslides and flooding, the result of more than 10 in (250 mm) of rain accompanying the storm, damaged many homes and roads. Rainfall at Hewanorra International Airport amounted to 13.19 in (335 mm). The nation's banana crop suffered significant damage; 85 percent of farms reported losses. Two homes were destroyed, one in Bisee, and one in Gros Islet; several others were damaged. Roads in Castries, Gros-Islet, Dennery, and Soufriere became impassible from debris or landslides. Some damage was also reported on Dominica, temporarily leaving many people without water and electricity. Heavy rainfall in Grenada disrupted the water supply in multiple communities. In Martinique strong winds, which gusted up to 89 mph (143 km/h) in Saint-Pierre, wreaked havoc on the power grid; roughly 55,000 people lost electricity. Numerous trees downed by the winds blocked roadways while heavy rains led to flooding. The main road from Fort-de-France to southern towns was rendered impassable during the storm. Approximately 4,000 people lost their water supply. Three people sustained minor injuries. The effects of Matthew across the ABC Islands were relatively limited despite its proximity. Some street flooding occurred on Aruba and Curaçao. Heavy winds were also experienced. There was some damage to cars after street flooding occurred. Outdoor bars and restaurants were damaged. The Guajira Peninsula of Colombia saw its first heavy rain event in three years, leading to widespread flash flooding. One person drowned in a swollen river in Uribia; 1.29 in (32.8 mm) of rain fell in 30 minutes in the town. Rainfall in Cartagena reached 8.7 in (222 mm) during a 24-hour span and Santa Marta saw 5.5 in (140 mm). Along coastal areas of the peninsula, large swells damaged buildings, prompting the evacuation of 380 people in Manaure. Roughly 70 percent of Tucurinca flooded when the Magdalena River overtopped its banks; a nearby bridge collapsed, isolating some communities. Approximately 73,000 people were affected by the floods. The dangerous conditions produced by Matthew prevented thousands of people from voting in a peace agreement referendum. Jamaica suffered relatively minor effects, characteristic of tropical storm conditions. Along the coast, rip currents and beach erosion was reported, with additional flooding due to rainfall occurring. Strong wind gusts tore at the island's vegetation, causing minor damage. Large swells reached the outlying Haitian island of Île-à-Vache on October 2, prompting the evacuation of 89 people. Despite boating bans, many fishermen continued work in rough conditions. Consequently, two fishermen went missing on the morning of October 3: one near Saint-Jean-du-Sud and the other near Aquin; one was later found dead. Antecedent rainfall associated with the outer bands of Matthew triggered flooding in several towns in southern Haiti and the Dominican Republic. A person was killed when a tree fell on his home in Port Salut, while a 26-year-old man drowned while trying to rescue a child from a rushing river. Striking the Tiburon Peninsula as a Category 4 hurricane on the morning of October 4, Matthew was the strongest storm to directly impact Haiti since Hurricane Cleo in 1964. An anemometer at Antoine-Simon Airport in Les Cayes, east of where Matthew made landfall, measured a gust of 107 mph (172 km/h) before the station went offline. Gusts in the nation's capital city of Port-au-Prince reached 60 mph (97 km/h). Communications with areas in the direct path of Matthew were lost, and tens of thousands of people became isolated as roads and bridges were destroyed. A major bridge connecting parts of Grand'Anse to the rest of the country collapsed during a flash flood. 80% of Jérémie, along the north shore of the Tiburon Peninsula, suffered tremendous damage; homes were flattened and medical facilities suffered major damage. A radio host in Port-au-Prince stated that Jérémie was "pretty much wiped out from the seaboard all the way to the cathedral". Officially, 546 deaths were attributed to the storm in Haiti, however local governments believed the death toll to be over 1,000; this value may have been overestimated. According to the nation's Civil Protection Directorate, the death toll was 546 as of October 14, with 128 people missing and 439 injured. This figure was later confirmed by the National Hurricane Center. The government also estimates damages at close to $1.9 billion. Approximately 2.1 million people were affected by the storm, of whom 1.4 million (12 percent of Haiti's population) were left in need of assistance. Furthermore, roughly 175,000 people were left homeless. The Dominican Republic reported significant rainfall and coastal flooding due to Matthew. An automated weather station in Cabo Rojo measured 8.43 in (214 mm) of rain by the afternoon of October 3. Four people died after a house collapsed on top of them. Coastal flooding began in Granma Province, Cuba, on October 2, affecting three towns along the Sierra Maestras. Hurricane Matthew struck the easternmost province of Cuba during the evening of October 4 as a Category 4, causing tremendous damage. The coastal city of Baracoa suffered widespread damage from violent winds, and storm surge, the latter of which gutted countless buildings. Despite the severity of damage, no fatalities were reported in the city. A communication tower in Majayara collapsed during the storm and a bridge spanning the Toa river was destroyed; several communities left isolated as a result. Damages in Cuba amounted to $2.58 billion USD; most of which occurred in the Guantánamo Province. Nearly two months later, on November 22, a municipal bridge in the city of Moa that was damaged by Hurricane Matthew collapsed, killing four employees of Canadian mining company Sherritt International. The employees were undertaking repairs to restore access between Moa and a mining site. Experiencing a direct hit from the eyewall of Matthew, Grand Bahama suffered extensive damage. An estimated 95 percent of homes in Eight Mile Rock and Holmes Rock sustained severe damage. Numerous trees and power lines were toppled by the storm's high winds, rendering roads impassable. Flooding-induced by the backside of the storm affected much of the western half of the island. Total losses from Matthew in the Bahamas are estimated to be around $600 million USD. In total, the storm killed 47 people in the US, including 26 in North Carolina, 12 in Florida, 3 in Georgia, 4 in South Carolina, and 2 in Virginia. According to the National Centers for Environmental Information, damage from Matthew across the United States reached approximately $10 billion. This ranked it the costliest national disaster in the country for 2016 alongside record floods in Louisiana. As Hurricane Matthew traveled rapidly towards the southeastern region of the United States, it hit closely to the coasts of Florida, South Carolina, Georgia, and North Carolina. On October 7 in Fernandina Beach, Florida, there was a peak surge of 9.88 ft (3.01 m) above normal. Additionally, in the St. Augustine area, water was reported to be 2.5 ft (0.76 m) above ground. As Matthew tracked parallel to the Florida coast, it left over one million people without power across the state of Florida. In Jacksonville it caused major sand dune damage and flooding in the St. Johns River. It also destroyed many properties and knocked out power for nearly 250,000 electrical customers. In Indialantic, Florida, firefighters exposed themselves to the storm's winds to put out a fire, which reportedly destroyed a greenhouse. In Florida, one woman died due to a heart attack; she had called for aid, but medical services were not able to arrive due to Matthew's high winds. Another two women were killed by falling trees. In the Flagler Beach area, a portion of Florida State Road A1A was washed away. At Kennedy Space Center, winds reached 80 mph (130 km/h) at ground level while a gust of 136 mph (219 km/h) was observed atop a 500 ft (150 m) tower. The facility suffered several million dollars-worth of damage, though overall impacts were less than anticipated. The roof of Operations Support Building II broke, and rainwater damaged the interior. Air conditioning was lost throughout Launch Complex 39 as well. The planned launches of GOES-R, NOAA's next generation weather satellite, and CYGNSS, a cluster of smaller satellites which study hurricanes, were delayed due to the suspension of operations during Matthew. Over 250,000 customers were left without power in Georgia after Hurricane Matthew affected the area. Roads were also blocked in the Brunswick, Georgia, area, where all access points to St. Simons Island were rendered impassable. Flooding in Charleston, South Carolina on October 8. Across South Carolina, at least 600,000 individuals lost power, where significant flooding was reported to have occurred in Charleston after a seawall was breached. Hilton Head Island experienced widespread water, sewer and power outages for several days, and the only road onto the island was not re-opened to residents until October 11. It is estimated that over 120,000 trees were downed on the island, causing extensive tree-strike damage to residences and businesses. Over 2.1 million cubic yards of vegetative debris generated by the storm was collected. The Waccamaw River crested in Conway at 17.9 ft (5.5 m), breaking a record set by the 1928 Okeechobee hurricane. The Little Pee Dee River reached a record crest of 17.1 ft (5.2 m) at Galivant's Ferry, also breaking a 1928 record. The Tar River overflowing its banks near Pitt–Greenville Airport on October 12; it later crested at 24.5 feet (7.5 m). Twenty-six people died in storm-related incidents across North Carolina. 680,000 in North Carolina were without power at one point. Sections of Interstate 95 in South Carolina and in North Carolina had to be shut down as a result of hurricane flooding. The North Carolina section reopened October 17. After 10 in (25 cm) of rain fell in Cumberland, Harnett, Hoke, Moore and Robeson Counties on September 28 causing flooding, Matthew dumped another 10 in (25 cm) to 14 in (36 cm). As a result, the Lumber River reached a record 24 ft (7.3 m) in the south end of Lumberton, breaking the record of 20.5 ft (6.2 m) feet. Robeson County schools did not reopen until October 31. In Smithfield, the Neuse River crested at 29.09 ft (8.87 m), 2 ft (0.61 m) higher than after Hurricane Fran. In Kinston, the Neuse crested at 28.31 ft (8.63 m), a foot (300 mm) higher than the record set by Hurricane Floyd. In Greenville, the Tar River crested at 24.5 ft (7.5 m). Preliminary estimates indicate that roughly 100,000 structures were flooded across the state and damage reached US$1.5 billion. Heavy rains and high winds resulted in trees falling and record flooding in Lago Mar, Virginia Beach, Virginia. When the hurricane hit Virginia, Matthew caused two deaths and street flooding in the eastern part of the state. The Northeast received heavy rain and minor flooding throughout the days of October 9 and 10. Satellite image loop from October 6, when Matthew was a hurricane, to October 11, when it had joined a mid-latitude storm sweeping across eastern Canada. Matthew's post-tropical remains were absorbed into a frontal zone off the coast of North Carolina. The humidity of the tropical system was drawn into the storm that was formed then. The latter gave heavy rain and strong winds in Nova Scotia, Prince Edward Island and Newfoundland from October 10 to 11. In Nova Scotia, rain amounts were recorded from east to west as 8.85 in (224.8 mm) in Sydney (Cape Breton Island), 5.09 in (129.2 mm) in Port Hawkesbury, 4.50 in (114.4 mm) in Chéticamp, 4.05 in (102.8 mm) in Halifax, 3.263 in (82.88 mm) in Kentville, and 1.94 in (49.2 mm) in Yarmouth. Heavy rains and strong winds caused flooding and dangerous conditions, particularly in the counties of Pictou, Antigonish, Guysborough and Cape Breton. Several roads were closed to heavy trucks, including Halifax Harbour bridges and the Confederation Bridge between New Brunswick and Prince Edward Island. Newfoundland was even more affected with accumulations generally ranging from 3.9 to 5.9 in (100 to 150 mm) in the central, southern and western areas. Steady rain fell sometimes at a rate of 0.39 to 0.79 in (10 to 20 mm) per hour, and even 1.7 in (42 mm) per hour in Burgeo. A private station in that community recorded a total of 9.23 in (234.4 mm), while the official station of the Gander International Airport signaled 6.45 in (163.8 mm). The rain caused numerous landslides and swollen rivers cut roads. The state of emergency was declared in Lewisporte, St. Alban's and Little Burnt Bay. The town of St. Alban's, a community of about 1,200, was cut off from the surrounding communities when the main bridge in town was carried by the waters and a nearby community (Conne River) provided a boat to transport people to St. Alban's and out of the community. The highway to Burgeo, on the south coast of Newfoundland, was also flooded and had to be closed. The winds of over 56 mph (90 km/h) also caused many fallen trees and electric power outages. The official maximum winds were recorded in Port aux Basques at 80 mph (128 km/h) and informally in Green Island, Fortune Bay, at 81 mph (130 km/h). Damage to roads across Newfoundland was assessed in excess of CA$10 million (US$7.6 million). In Martinique, Électricité de France requested additional crews from Guadeloupe and French Guiana to help restore power. Members of the military and Forces françaises aux Antilles were deployed to assist in clearing debris from roadways. The St. Lucia Red Cross distributed non-food items to 270 people affected by the storm. On October 4, the United States prepared the aircraft carrier, the hospital ship USNS Comfort—which previously aided thousands in the wake of the 2010 Haiti earthquake—and the transport dock for relief operations in Haiti. USS Mesa Verde and USS George Washington were later relieved by USS Iwo Jima, along with the 24th Marine Expeditionary Unit. United States Southern Command also deployed 100 troops with 9 helicopters to the Cayman Islands to prepare for relief work. Initial estimates indicated at least 350,000 people were in need of assistance. The bridge between the south and Port-au-Prince was destroyed. As a result, aid agencies reported they were having difficulty getting around to the most damaged and storm-affected parts of Haiti. The commander of U.S. forces in the Caribbean reported that troops and 6 helicopters from Joint Task Force-Bravo had been deployed to Haiti for the aftermath, and were expected to arrive on October 6. These are expected to help with search-and-rescue missions as well as providing medical assistance. In addition to his, a one-star navy admiral will also travel to lead the task force involved in the operations. More than 300 military personnel will most likely travel to Haiti, with 300 Marines on board on the ships sent out for aid from the U.S.
Action Aid reported that over 50,000 people were in immediate need of clean water and shelters. World Nation also sent out helicopters, reporting difficulties and their concern about young children and food. They will be providing water and sanitation for over 50,000 people. The UN's World Food Program arranged for enough food to feed up to 300,000 people for a month. A further 34 tonnes are ready in Miami to be used if needed. UNICEF will be providing life-saving aid for 10,000 people. UN's Food and Agricultural Organisation said it would be helping farmers rebuild their businesses by providing seeds. The US Agency for International Development said it would provide $400,000 for aid to Jamaica and Haiti on October 3. Red Cross launched a campaign to raise $9.6 million to provide water, shelter, and food for 50,000 people. They also sent a large number of local volunteers to the south. The World Food Programme coordinated with the Government of Cuba to provide food to approximately 180,000 people in need across eastern provinces. The operation would span six months and cost US$4 million. In Georgia, the Governor retracted previous evacuations later, emphasizing that their lives could not be endangered for those who chose not to leave. 1,000 members of the National Guard were deployed for help later. In North Carolina, nearly 900 people had been rescued by boat crews by the morning of October 9. In April 2017, North Carolina Governor Roy Cooper requested $929 million in federal funds. The following month, the Trump administration denied more than 99 percent of this request and only provided $6.1 million to the state. On March 26, 2017, it was announced by the World Meteorological Organization that the name Matthew was retired, due to the extensive damage and loss of life it caused along its track, particularly in Haiti, Cuba, and the United States, and will never again be used to name an Atlantic hurricane. It will be replaced with Martin for the 2022 Atlantic hurricane season. Hurricane Hazel – Took a similar track through the Caribbean in 1954, and struck North Carolina as a Category 4 hurricane. Hurricane David – Made landfall in the Dominican Republic as a Category 5 before skirting the eastern coast of Florida in 1979. Hurricane Tomas – Traced a slightly similar path in the Caribbean, but stayed out to sea rather than curving towards the United States after impacting Hispaniola in 2010. Hurricane Joaquin – Ravaged the Central Bahamas roughly a year before Matthew. ^ Although Hurricane Sandy was significantly deeper and made landfall much farther north in late October 2012, it was an extratropical cyclone at the time of landfall. ^ a b c d e f g h i j k l m n Stewart, Stacy R (April 3, 2017). Tropical Cyclone Report: Hurricane Matthew (PDF) (Technical report). 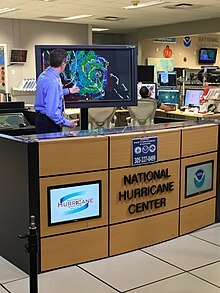 United States National Hurricane Center. Retrieved April 5, 2017. ^ "Matthew Storm History". The Weather Channel. October 3, 2016. Retrieved 16 October 2016. ^ Lixion A. Avila (September 30, 2016). Hurricane Matthew Public Advisory Number 12 (Report). National Hurricane Center. Retrieved October 1, 2016. ^ "Hurricane Matthew Records/Notable Facts Recap (through October 8)" (PDF). Colorado State University. October 8, 2016. Retrieved March 25, 2017. ^ "Philip Klotzbach on Twitter". twitter.com. Retrieved April 10, 2017. ^ Makeida Antonio (September 28, 2016). "Weather disturbance draws nearer to Eastern Caribbean". The Daily Observer. Retrieved September 30, 2016. ^ "Schools Closed on Wednesday 28 September" (Press release). National Disaster Management Agency. September 28, 2016. Retrieved September 30, 2016 – via Grenada Now. ^ a b c d e "One dead as Matthew batters Eastern Caribbean". Jamaica Observer. Kingstown, St. Vincent. Caribbean Media Corporation. September 30, 2016. Retrieved September 30, 2016. ^ a b c "One dead in St Vincent as Matthew rages". National News. Kingstown, St. Vincent. Caribbean Media Corporation. September 29, 2016. Retrieved September 30, 2016. ^ a b "Next Steps in Saint Lucia Recovery After Tropical Storm Matthew". St. Lucia Times. September 30, 2016. Retrieved October 1, 2016. ^ Daniel Brown (September 28, 2016). Tropical Storm Matthew Public Advisory Number 1 (Report). Miami, Florida: National Hurricane Center. Retrieved October 2, 2016. ^ Daniel Brown (September 28, 2016). Tropical Storm Matthew Public Advisory Number 2 (Report). Miami, Florida: National Hurricane Center. Retrieved September 30, 2016. ^ Daniel Brown and Richard Pasch (September 29, 2016). Hurricane Matthew Public Advisory Number 6 (Report). Miami, Florida: National Hurricane Center. Retrieved September 30, 2016. ^ Michael Brennan (September 30, 2016). Hurricane Matthew Public Advisory Number 10 (Report). Miami, Florida: National Hurricane Center. Retrieved October 2, 2016. ^ a b c "Edge of Hurricane Matthew whips at Aruba, Bonaire, Curacao". Oranjestad, Aruba: Fredricksburg.com. Associated Press. September 30, 2016. Archived from the original on October 18, 2016. Retrieved September 30, 2016. ^ a b "Orkaan Matthew op Curaçao lijkt storm in glas water" (in Dutch). Nederlandse Omroep Stichting. September 30, 2016. Retrieved September 30, 2016. ^ a b Eliana Mejía Ospino (September 30, 2016). "La Guajira, en alerta roja por huracán Matthew". El Tiempo (in Spanish). Retrieved September 30, 2016. ^ a b c d Sandra Guerrero Barriga (October 1, 2016). "'Matthew' coge fuerza en su avance frente a la Costa". El Heraldo (in Spanish). Retrieved October 1, 2016. ^ Kimone Francis (September 30, 2016). "Met Service says Jamaica in Hurricane Matthew's cross hairs". Jamaica Observer. Retrieved September 30, 2016. ^ a b Michael Brennan (September 30, 2016). Hurricane Matthew Public Advisory Number 11 (Report). Miami, Florida: National Hurricane Center. Retrieved October 2, 2016. ^ a b c Michael Brennan (October 1, 2016). Hurricane Matthew Public Advisory Number 15 (Report). Miami, Florida: National Hurricane Center. Retrieved October 2, 2016. ^ Mark Cummings (October 2, 2016). "#TrackingMatthew: Trelawny beach closed, shelter managers put on alert". Jamaica Observer. Archived from the original on October 3, 2016. Retrieved October 2, 2016. ^ "Jamaica braces for Matthew's fury". Jamaica Observer. October 2, 2016. Retrieved October 2, 2016. ^ "#TrackingMatthew: JUTC to terminate services at six o'clock". Jamaica Observer. Kingston, Jamaica. October 2, 2016. Retrieved October 2, 2016. ^ "#TrackingMatthew: JPS might shut down power plants if hurricane severe". Jamaica Observer. Kingston, Jamaica. October 2, 2016. Retrieved October 2, 2016. ^ "#TrackingMatthew: JDF deploys troops islandwide". Jamaica Observer. Kingston, Jamaica. October 2, 2016. Retrieved October 2, 2016. ^ a b "First taste of Hurricane Matthew leaves city roads flooded". Jamaica Observer. October 3, 2016. Retrieved October 3, 2016. ^ "#TrackingMatthew: All Gov't offices, tax offices closed". Jamaica Observer. Kingston, Jamaica. October 3, 2016. Retrieved October 3, 2016. ^ John Bacon (October 3, 2016). "Hurricane Matthew may hit Haiti, Jamaica with 25 inches of rain". USA Today. Retrieved October 3, 2016. ^ a b c Daniel Brown and Robbie Berg (October 2, 2016). Hurricane Matthew Public Advisory Number 17 (Report). Miami, Florida: National Hurricane Center. Retrieved October 2, 2016. ^ a b "Hurricane Matthew: Evacuations in Haiti as powerful storm looms". BBC. October 2, 2016. Retrieved October 2, 2016. ^ a b "Matthew : Schools closed on Monday and Tuesday – Address to the Nation of Privert". Haiti Libre. October 3, 2016. Retrieved October 3, 2016. ^ a b c "Huracán Matthew deja 1 muerto en Haití y 8 mil 500 evacuados en República Dominicana" (in Spanish). RCN Radio. Agencia EFE. October 3, 2016. Retrieved October 3, 2016. ^ a b Wright, Pam (October 3, 2016). "Hurricane Matthew Kills Two Fishermen in Haiti; They 'Took Risks to Feed Their Families,' Official Says". The Weather Channel. Retrieved October 3, 2016. ^ "Haiti – FLASH : The elections of October 9 postponed". Haiti Libre. 5 October 2016. Retrieved 6 October 2016. ^ Daniel Brown and Robbie Berg (October 2, 2016). Hurricane Matthew Intermediate Public Advisory Number 16A (Report). Miami, Florida: National Hurricane Center. Retrieved October 2, 2016. ^ a b c Carlos Sanabia Marrero (October 2, 2016). "Primeros daños y evacuados por huracan Matthew en Santiago de Cuba". Radio Rebelde. Retrieved October 2, 2016. ^ a b Manuel Juan Somoza (October 2, 2016). "Cuba inicia evacuación por huracán 'Matthew'". Milenio (in Spanish). Retrieved October 2, 2016. ^ "#TrackingMatthew: Bahamas preparing for passage of Hurricane Matthew". Jamaica Observer. Nassau, Bahamas. October 3, 2016. Retrieved October 3, 2016. ^ "Gov. Rick Scott Issues State of Emergency For All Counties in Florida Ahead of Hurricane Matthew". NBC6. October 3, 2016. Retrieved October 3, 2016. ^ LaFleur, Elizabeth (October 4, 2016). "1.1 million South Carolinians could be evacuated". Greenville Online. Retrieved October 4, 2016. ^ Andy Paras (October 5, 2016). "I-26 eastbound lane reversal in effect: what you need to know". WCIV. Retrieved October 5, 2016. ^ "Cape Lookout National Seashore evacuating ahead of Hurricane Matthew". Carteret County News-Times. October 4, 2016. Retrieved October 4, 2016. ^ "Gov. Nathan Deal declares state of emergency ahead of Hurricane Matthew". WTOC. October 4, 2016. Retrieved October 4, 2016. ^ Berman, Dave (October 4, 2016). "Port Canaveral closing to ships, business on Wednesday". Florida Today. Retrieved October 6, 2016. ^ a b Dean, James (October 4, 2016). "KSC, Cape Canaveral AFS preparing for Hurricane Matthew". Florida Today. Retrieved October 6, 2016. ^ Berger, Eric (October 4, 2016). "Hurricane Matthew poses a significant threat to Kennedy Space Center". Ars Technica. Retrieved October 6, 2016. ^ "Hurricane Matthew forces Disney World to close for 4th time ever". USA Today. Retrieved October 10, 2016. ^ "Hurricane Matthew – Theme Park Closings and Updates – Attractions Magazine". Attractions Magazine. October 6, 2016. Retrieved October 6, 2016. ^ Menzer, Joe (October 7, 2016). "Rain washes out XFINITY race, all Friday activities at Charlotte". Fox Sports. Retrieved October 8, 2016. ^ Jensen, Tom (October 8, 2016). "NASCAR Sprint Cup race at Charlotte postponed until Sunday". Fox Sports. Retrieved October 8, 2016. ^ Mazzei, Patricia; Clark, Kristen (October 6, 2016). "Obama signs Florida emergency declaration to deal with Hurricane Matthew". The Miami Herald. ^ Merle, Renae; Berman, Mark (October 6, 2016). "Hurricane Matthew, now a Category 3 storm, approaches Florida; emergencies declared in three states". The Washington Post. ^ "Hurricane Matthew Approaches Florida; Governor Urges 1.5 Million to Flee". The New York Times. October 6, 2016. ISSN 0362-4331. Retrieved October 6, 2016. ^ "Florida governor tells residents to 'evacuate, evacuate, evacuate'". NBC News. Retrieved October 6, 2016. ^ "'Hurricane Matthew will kill you & your kids': Fox News anchor issues dire warning". RT International. October 8, 2016. Retrieved October 10, 2016. ^ Berry, Lorraine (October 7, 2016). "I almost refused to evacuate before Hurricane Matthew. Here's why I changed my mind". Vox. Retrieved October 10, 2016. ^ "Gov. Deal: Savannah, all coastal Georgia east of I-95 under mandatory evacuation". Savannah Morning News. October 6, 2016. Retrieved October 7, 2016. ^ Sanchez, Juan (October 6, 2016). "Contraflow begins on I-16 in Georgia to help motorists evacuate". WJCL-TV. Retrieved October 7, 2016. ^ a b Jason Samenow (October 6, 2016). "Drudge Report's playing down and politicizing of Hurricane Matthew was 'deplorable'". The Washington Post. Retrieved October 6, 2016. ^ "Storm Fizzle? Matthew Looks Ragged!". Drudge Report. October 6, 2016. Archived from the original on October 14, 2016. Retrieved October 12, 2016. ^ a b c Sam Sanders (October 7, 2016). "Matt Drudge Suggests Government May Be Lying About Hurricane Matthew". NPR. Retrieved October 7, 2016. ^ Chris D'Angelo (October 7, 2016). "Matt Drudge's Hurricane Theory Takes Conspiracies To A Dangerous Level". The Huffington Post. Retrieved October 7, 2016. ^ Reena Flores (October 7, 2016). "Matt Drudge suggests government is "lying" about Hurricane Matthew". CBS News. Retrieved October 7, 2016. ^ a b Government of the Bahamas (October 20, 2016). "PM Christie: Hurricanes Matthew and Joaquin Losses Estimated in Hundreds of Millions". Relief Web. Retrieved October 29, 2016. ^ a b "'Absolutely unbelievable' road damage, some areas still cut off". CBC News. October 14, 2016. Retrieved October 17, 2016. ^ a b "Bridge damaged by Hurricane Matthew collapses in Cuba, killing 4". BNO News. November 23, 2016. Archived from the original on November 24, 2016. Retrieved November 23, 2016. ^ a b "Hurricane Matthew slams Haiti, takes aim at US East Coast". Associated Press. ^ a b "Haiti: Cholera spreads from Hurricane Mathew, death toll reaches 546". News Ghana.com. News Ghana. Retrieved 14 October 2016. ^ a b c Haiti Hurricane Matthew Situation Report #07 (PDF) (Report). ReliefWeb. World Food Programme. October 11, 2016. Retrieved October 12, 2016. ^ a b "Tropical Storm Matthew Near Hurricane Strength in the Caribbean Sea; Jamaica, Hispañola, Cuba, Bahamas Threats Next Week". The Weather Channel. September 29, 2016. Retrieved September 30, 2016. ^ "Update on Water Systems" (Press release). National Water and Sewerage Authority. September 29, 2016. Retrieved September 30, 2016 – via Now Grenada. ^ a b "Tempête Matthew en Martinique : 3 blessés et 55.000 personnes sans électricité" (in French). La Chaîne Info. September 30, 2016. Retrieved September 30, 2016. ^ "Huracán Matthew se fortalece y aumenta a categoría cuatro". Noticias Caracol (in Spanish). September 30, 2016. Retrieved September 30, 2016. ^ a b Juan David Umaña Gallego (October 3, 2016). ""Matthew" provocó estragos en la Costa". El Colombiano (in Spanish). Retrieved October 3, 2016. ^ "Fuertes inundaciones se registran en zona bananera, Magdalena". El Universal (in Spanish). Bogotá, Colombia. Colprensa. October 2, 2016. Retrieved October 2, 2016. ^ "Lluvias por coletazo del huracán Matthew afectan el plebiscito en Colombia". La Vanguardia (in Spanish). Bogotá, Colombia. Agencia EFE. October 2, 2016. Retrieved October 2, 2016. ^ "Haiti – FLASH : Matthew, first evacuations in Haiti". Haiti Libre. October 2, 2016. Retrieved October 2, 2016. ^ "At least 11 people dead as Hurricane Matthew makes landfall". Toronto Star. Associates Press. October 4, 2016. ^ McNoldy, Brian; Fritz, Angela; Samenow, Jason (October 4, 2016). "Hurricane warning in Florida after Matthew strikes Haiti as strongest hurricane in 52 years". The Washington Post. Retrieved October 6, 2016. ^ a b "Hurricane Matthew: Haiti dead reach 800 as south awaits aid". BBC News. October 8, 2016. Retrieved October 8, 2016. ^ a b "Hurricane Matthew: New images show scale of Haiti destruction". BBC. October 6, 2016. Retrieved October 6, 2016. ^ Bernhard, Mühr; Daniell, James; Wisotzky, Christina; Wandel, Jan; Becker, Florian; Buchholz, Marcel; Baumstark, Sven; Dittrich, André. "C EDIM Forensic Disaster Analysis Group (FDA) Hurricane Matthew 1 4 October 2016 – Report No. 2" (PDF). Center for Disaster Management and Risk Reduction Technology. Retrieved 23 October 2016. ^ "Matthew Kills 1,332 In Haiti, Cholera Spreading In New Outbreak". ^ Delva, Joseph; Craft, Diane. "Hurricane Matthew death toll in Haiti hits 1,000". Reuters. Retrieved October 10, 2016. ^ @Reuters (October 7, 2016). "BREAKING: Hurricane Matthew death toll in Haiti rises to 842 – local officials" (Tweet). Retrieved October 7, 2016 – via Twitter. ^ "'Catastrophic' Hurricane Matthew Devastates Haiti, 339 Dead". TeleSur. October 3, 2016. ^ "Hurricane Matthew: Haiti in national mourning as aid gears up". BBC News. October 9, 2016. Retrieved October 9, 2016. ^ Office for the Coordination of Humanitarian Affairs (OCHA), United Nations (October 13, 2016). "HAITI, Hurricane Matthew Situation Report Number 9 (13 October 2016)" (PDF). Humanitarian Response Info. United Nations. Archived from the original (PDF) on May 10, 2017. Retrieved October 14, 2016. ^ "Hurricane Matthew damage tally in Haiti nearly $2 bn". Yahoo News. October 29, 2016. ^ John Morales [@JohnMoralesNBC6] (October 3, 2016). "Official @onamet automated rain gauge in southwestern Dominican Republic (Cabo Rojo, Pedernales Province) has received 8.43" of rain already" (Tweet). Retrieved October 3, 2016 – via Twitter. ^ a b "Hurricane Matthew in Cuba causes over 2.5 bln USD in damage". New China. Xinhua. Retrieved 3 November 2016. ^ "Lluvias intensas observadas y grandes inundaciones reportadas" [Heavy rains observed and large reported floods] (in Spanish). Instituto Nacional de Recursos Hidráulicos. 2003. Archived from the original on 2007-03-12. Retrieved February 10, 2007. ^ Jerry Iannelli (October 5, 2016). "Hurricane Matthew Destroyed Parts of Baracoa, Cuba, Last Night". Miami News-Times. Retrieved October 6, 2016. ^ Rashad Rolle (October 7, 2016). "Grand Bahama Suffers Significant Damage As Matthew Roars Through". Tribune 242. Retrieved October 7, 2016. ^ Neil Hartnell (October 11, 2016). "Matthew Payouts To 'Absolutely' Be Nine-Figure Sum". Tribune 242. Retrieved October 12, 2016. ^ "[Florida Event Reports related to Hurricane Matthew]". National Centers for Environmental Information. 2017. Retrieved February 27, 2017. ^ Amy Wenk (October 21, 2016). "Hurricane Matthew damages reach $90 million in Georgia". Atlanta Business Journal. Retrieved February 27, 2017. ^ a b Jay Price (February 24, 2017). "Road To Recovery Remains Long For Cities Hardest Hit By Hurricane Matthew". WUNC. Retrieved February 27, 2017. ^ "[South Carolina Event Reports related to Hurricane Matthew]". National Centers for Environmental Information. 2017. Retrieved February 27, 2017. ^ "[Virginia Event Reports related to Hurricane Matthew]". National Centers for Environmental Information. 2017. Retrieved February 27, 2017. ^ "Hurricane Matthew Death Toll Rises, 'Difficult Days' Ahead, N.C. Governor Says". NBC News. Associated Press. Retrieved 15 October 2016. ^ "McCrory says death toll from Hurricane Matthew rises to 28". The Dispatch. The Associated Press. Archived from the original on November 14, 2016. Retrieved October 28, 2016. ^ Stradling, Richard (October 15, 2016). "Hurricane Matthew death toll rises again in NC as floodwater recedes". News & Observer. Retrieved October 15, 2016. ^ a b Staff, WAVY News (October 9, 2016). "Man found dead in standing water in Hampton". Retrieved October 25, 2016. ^ "Billion-Dollar Weather and Climate Disasters: Table of Events". National Centers for Environmental Information. 2017. Retrieved February 27, 2017. ^ "Hurricane Matthew Recap: Destruction From the Caribbean to the United States". The Weather Company. Hurricane News. 10 October 2016. Retrieved 21 November 2016. ^ Shapiro, Emily; Winsor, Morgan (October 7, 2016). "Hurricane Matthew Batters Florida Coast; 3 Dead as Over 1 Million Lose Power". ABC News. Retrieved October 7, 2016. ^ Petkar, Sofia. "Hurricane Matthew is the 'most dangerous storm in living memory'". Metro. UK. Retrieved October 8, 2016. ^ Dean, James (October 7, 2016). "Firefighters douse Indialantic blaze". Florida Today. Retrieved October 7, 2016. ^ "Hurricane Matthew Avoids Direct Hit on Florida, Continues North". The New York Times. October 7, 2016. Retrieved October 7, 2016. ^ "Hurricane Matthew kills 10 in US, floods Carolinas". BBC. Retrieved October 9, 2016. ^ "Hurricane Matthew washes away parts of A1A in Flagler County". WFTV. October 7, 2016. Retrieved October 8, 2016. ^ James Dean (October 12, 2016). "Hurricane Matthew at KSC: Millions in damages". Florida Today. Retrieved October 12, 2016. ^ Marco Santana (October 11, 2016). "Hurricane Matthew challenged latest prediction tech". Orlando Sentinel. Retrieved October 12, 2016. ^ Santana, Marco. "NASA's GOES-R satellite launch delayed again". OrlandoSentinel.com. ^ "Pegasus launches hurricane-hunting satellites for NASA". USA TODAY. ^ Smith, Bruce; Bynum, Russ (October 8, 2016). "A weakening Matthew rakes Atlantic coast; US deaths at 10". Associated Press. Retrieved October 8, 2016. ^ "Weakened Hurricane Matthew Makes Landfall in South Carolina". The New York Times. October 8, 2016. Retrieved October 8, 2016. ^ Weaver, Emily (October 19, 2016). "1928 hurricane left its mark in Horry County, but then came Matthew". The Sun News. Retrieved October 20, 2016. ^ a b King, Heather (October 13, 2016). "Greenville Update: Inspectors preparing to assess damage". WITN. Retrieved October 17, 2016. ^ Minnick, Beau (October 9, 2016). "As Raleigh recovers from Matthew, power outages could last a week in NC". WNCN. Retrieved October 10, 2016. ^ deBruyn, Jason. "Dam Breached: Sixty Miles Of I-95 Closed In Matthew's Aftermath". WUNC. Retrieved October 12, 2016. ^ Chason, Rachel (October 17, 2016). "I-95 reopens in NC; flooding keeps power out in some areas". News & Observer. Retrieved October 18, 2016. ^ Quillin, Martha (October 15, 2016). "Misery now, a struggle ahead for Robeson County after flooding from Hurricane Matthew". News & Observer. Retrieved October 16, 2016. ^ Harlan, Chico; Fritz, Angela (October 12, 2016). "Flooding death toll climbs to 19 in North Carolina after Hurricane Matthew". Washington Post. Retrieved October 12, 2016. ^ "Death toll from Hurricane Matthew rises to 28 in NC, Gov. Pat McCrory says". Winston-Salem Journal. Associated Press. October 27, 2016. Retrieved October 28, 2016. ^ Jackson, Drew; Bennett, Abbie (October 10, 2016). "Record flood waters crest in Johnston County". News & Observer. Retrieved November 3, 2016. ^ Pulliam, Tim; Hoggard, DeJuan; Hohmann, Chris (October 15, 2016). "Neuse River crests in Kinston, flooding could last days". WTVD. Retrieved October 16, 2016. ^ "NC Hurricane Matthew damage estimate more than a billion dollars". WYFF. October 16, 2016. Retrieved October 16, 2016. ^ "Matthew's Heavy Rain Floods Parts of Virginia; Multiple Road Closures Reported". The Weather Channel. Retrieved October 11, 2016. ^ "NHC: Matthew downgraded to post-tropical cyclone". am New York. Retrieved October 11, 2016. ^ a b "Les Maritimes se relèvent difficilement des inondations et pannes d'électricité". ICI Radio-Canada (in French). October 11, 2016. Retrieved October 11, 2016. ^ a b c "La tempête cause des dégâts pour au moins 1,5 millions de dollars à T.-N.-L". ICI Radio-Canada (in French). October 11, 2016. Retrieved October 11, 2016. ^ Meteorological Service of Canada. "Newfoudnland-and-Labrador". Station Results – Historical Data. Environment Canada. Retrieved October 11, 2016. ^ a b "Multiple states of emergency declared as heavy rains batter central Newfoundland". Canadian Broadcasting Corporation. October 11, 2016. Retrieved October 11, 2016. ^ "Update on recovery effort in the aftermath of Tropical Storm Matthew". St. Lucia News. October 2, 2016. Retrieved October 2, 2016. ^ David B Larter and Mark D. Faram (October 4, 2016). "Carrier George Washington to deploy for Hurricane Matthew relief". Navy Times. Retrieved October 4, 2016. ^ "Hurricane Matthew: Strongest storm since 2004 nears Florida". BBC News. October 6, 2016. Retrieved October 6, 2016. ^ "Hurricane Matthew Kills At Least 136 in Haiti: 'The Situation Is Catastrophic,' Says Haitian President". The Weather Channel. Retrieved October 6, 2016. ^ Jones, Sam (October 6, 2016). "Hurricane Matthew: at least 136 people killed in Haiti, officials say". The Guardian. ISSN 0261-3077. Retrieved October 6, 2016. ^ Jones, Sam; Woolf, Nicky (October 5, 2016). "Hurricane Matthew makes landfall in Cuba after ripping through Haiti". The Guardian. ISSN 0261-3077. Retrieved October 6, 2016. ^ "Local Red Cross volunteers head south to help with Hurricane Matthew". BINGHAMTONHOMEPAGE. October 7, 2016. Retrieved October 8, 2016. ^ "WFP to provide food assistance in Cuba in the wake of Hurricane Matthew". Havana, Cuba: ReliefWeb. World Food Programme. October 10, 2016. Retrieved October 11, 2016. ^ "Matthew Batters Southeast; 6 Dead, Over 1.4 Million Lose Power". ABC News. October 8, 2016. Retrieved 2016-10-08. ^ "Hurricane Matthew Toll Climbs to at Least 15 as North Carolina Suffers Record-Breaking Flooding". The New York Times. October 9, 2016. Retrieved October 9, 2016. ^ "99 percent of Hurricane Matthew aid requested by NC denied by Trump administration". WNCN. May 10, 2017. Retrieved May 10, 2017. ^ "World Meteorological Organisation retires storm names Matthew and Otto". National Oceanic and Atmospheric Administration. 27 March 2017. Retrieved 27 March 2017. Wikimedia Commons has media related to Hurricane Matthew. Taylor, SRA Mercedes (October 12, 2016). "Little Rock AFB provides humanitarian support". Armed Forces News Service. Retrieved October 14, 2016. Scalf, TSG Ralph (October 17, 2016). "US provides initial critical aid in Haiti". Armed Forces News Service. Retrieved October 18, 2016. "AF heads to Haiti for Matthew relief". Joint Base McGuire-Dix-Lakehurst Public Affairs. October 7, 2016. Retrieved October 18, 2016.